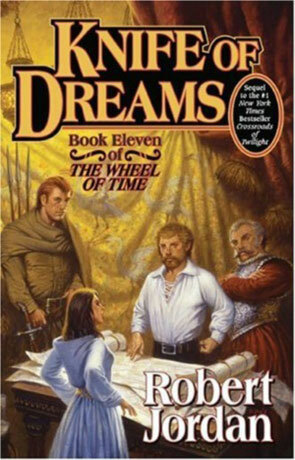 Knife of Dreams is the eleventh volume in the epic Wheel of Time series and is the last full volume written by Robert Jordan. If you have like me arrived here after reading the first 10 volumes then you will appreciate this moment, a long journey, hugely rewarding and it is with a sense of trepidation that we approach the eleventh and last volume written by the Late Robert Jordan. Matt continues to court his self confessed future wife Tuon, who also happens to be the heir to the Seanchan empire as Daughter of the Nine Moons. Still on the move in potentially hostile territory, Matt must keep her (and his other followers) safe from the continued invasion by the Seanchan. Perrin meanwhile continues his plan to rescue his wife Faile from the Shaido Aiel, having already made a pact with the Seanchan they plan a daring mission that could spell disaster if it goes wrong. Faile meanwhile works to free herself and her Gai'shain followers while trying to avoid the amorous advances of a very determined Aiel. Ewgene works from within to subvert the power struggles in the tower and gain control from the inside, while maintaining her dignity as the Amyrlin Seat. In the Andor capital of Caemlyn, Elayne Trakand continues her battle to take her place as the rightful ruler and Queen of Andor but she faces danger not only from her political opposition but also even closer to home. Rand, the Dragon reborn continues to suffer from the lasting effects of the taint, even though saidin is now clean, his struggle with Lews Therin also reaches a critical mass, with destructive consequences. Knowing that Tarmon Gai'don draws near, Rand seeks a truce with the Seanchan, knowing he needs combined might if he is to have a chance of success. Knife of Dreams is the fastest paced novel in the Wheel of Time series yet, a true masterpiece of drama, action and intrigue by Jordan, and the best novel in the series by far. You get a real sense that Tarmon Gai'don is approaching with more signs and portents than the complete works of Nostrodamus, while each major character gets their much needed space to develop their own plot arc. Again in my opinion Matt's scenes are the best in the book, with the interplay with Tuon both amusing and intriguing (just what is she really planning?) and Matt's apparent hap-hazard approach very refreshing. There is also a great deal of action in Knife of Dreams with a number of battles and fight scenes scattered throughout the book. By the end of this novel while all the individual story arcs have developed significantly, you can in my opinion clearly see that it would still take more than one more volume to complete this epic tale (at least to do any real justice) and the decision to play the remaining story over 3 volumes is justified. Knife of Dreams remains the pinnacle of Jordan's literary achievement, and in a way a fitting tribute to a vastly talented author. Written on 1st May 2010 by Ant.